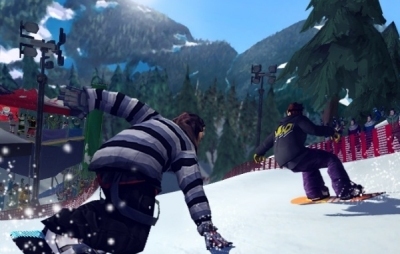 Shaun White's Snowboarding World Stage expands and improves on the original's visuals, controls and gameplay. While not as open or explorable as Family Ski and Snowboard, Shaun White's Snowboarding World Stage continues its success of being both accessible and exhilarating. Being the first snowboarding game to support MotionPlus also makes it easier to pick-up and play for children and younger players. Racing games, although sometimes seen as a sporting sub category, are a well established video game genre in their own right. 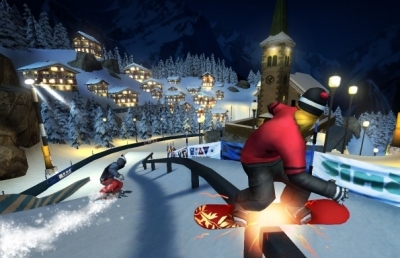 While other snowboarding and skiing games like We Ski or Mario and Sonic at the Winter Olympics focus on recreating, move for move, the snow bound experience, Shaun White's Snowboarding World Stage concentrates on getting the feel and simplicity of the experience right.This boarding aesthetic has players influence rather than directly control the game. This gives it a more laid back and easier feel. Using either a Wii-mote on its own, the BalanceBoard from Wii-fit or plugging in the MotionPlus add-on you can play through the single player campaign. This takes in challenges from speed runs, token collecting or trick runs. 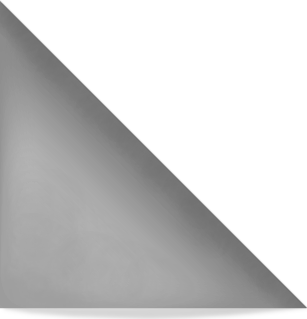 Each slope has a number of different levels like this, and is revisited at different points in the game. As before, there are also half-pipe levels that introduce more trick focused events. But new in Shaun White's Snowboarding World Stage is the inclusion of these half pipe elements within a down-hill slope. Also new in the sequel are the expanded race modes. Whereas originally you could only take on one other boarder down a slope, you can now compete against up to six computer controlled opponents, in addition to the four human players, to create a much greater sense of competitive racing. Up to four players can play together competitively or cooperatively. Again, the simplicity and directness of the gameplay makes these multiplayer modes both fun and accessible. The only limitation here is that only one player can use the Balance Board at one time - a limitation of the Nintendo Wii system. The controls can be as simple as tilting the Wii-mote left and right to steer and giving it a tug to jump. But as you get used to the game, particularly with MotionPlus or Balance Board attached, you realise there are literally hundreds of speed, trick and jump combinations that can be pulled off. Combine this with the character development and range of special moves and you have a fully featured racing game. The sheer feel of genuine snowboard is a big draw for Shaun White's Snowboarding World Stage. But it's the controls rather than the visuals that continue to impress when you play it. The combination of Balance Board and MotionPlus gives an incredible sense of control and connection to the action. Even without the Balance Board in four player mode,MotionPlus makes these contents real knife edge experiences. 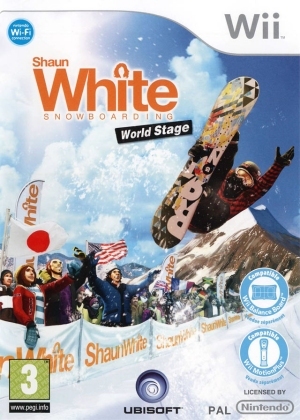 Whereas players look for a more in depth game with Family Ski, Shaun White's Snowboarding World Stage offers something more direct and instant. 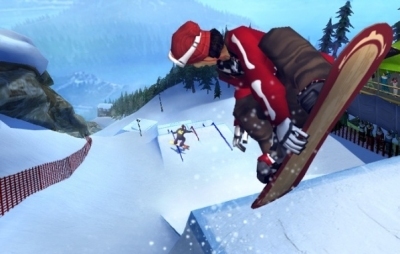 The addition of MotionPlus in this sequel however means that players can really learn each jump, move and trick with greater accuracy, as well as create their own custom motions. Stepping onto the slope for the first time in Shaun White's Snowboarding World Stage is an exhilarating experience. The visual blur and rushing wind combine with the nuance controls to make it an incredibly more-ish game. Very young or novice players will love the simplicity of gameplay. Even the very youngest children or infants can play along with the rest of the family. Those a little older and intermediates players will enjoy unlocking levels, new characters and the excellent cartoon cut scenes. Expert players will most likely want to play this with a Balance Board and MotionPlus on the Wii-mote. Setup like this it becomes an experience of real depth. This requires as much deft touch and nuanced control as any other racing game. 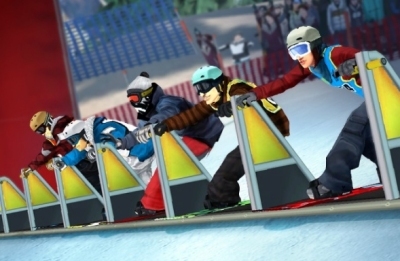 The four player mode of Shaun White's Snowboarding World Stage on the Nintendo Wii also adds a lot of value to more expert groups of players.